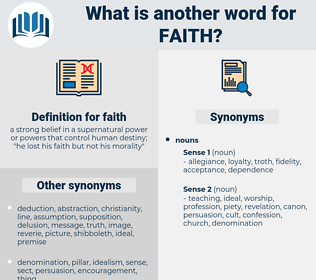 What is another word for faith? a strong belief in a supernatural power or powers that control human destiny; " he lost his faith but not his morality"
loyalty, self-confidence, persuasion, devotion, trusting, fidelity, affiliation, allegiance, believing, hope, commitment, truth. 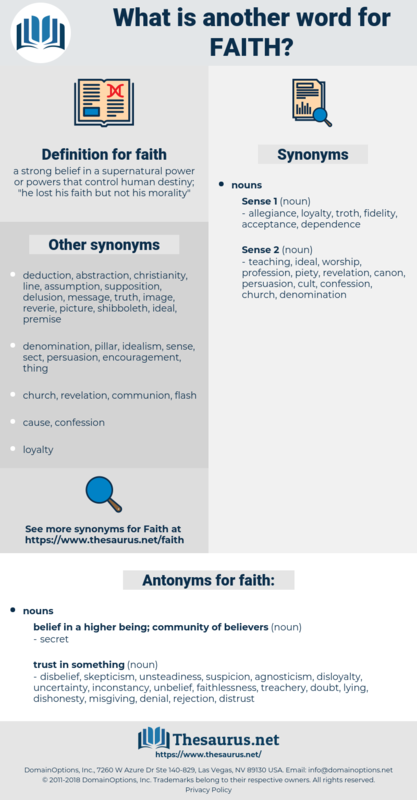 confessions, belief, confidence, religion, feith, worship. denomination, confession, belief, faithfulness, sincerity, believer, confidence, trustworthiness, credibility, religion, goodwill, worship. skepticism, suspicion, distrust, inconstancy, lying, unbelief, misgiving, unsteadiness, faithlessness, uncertainty, dishonesty, doubt, disloyalty, disbelief. disaffection, discredit, disillusionment, denial, agnosticism, rejection, Unfaith, lapse, uncertainness, disenchantment, estrangement, godlessness, apostasy, treachery, Know-nothingism, alienation, atheism, tergiversation, dissent, separation, secularism, disillusion, dubiousness. For the rest - For the rest, Faith? Faith, it's turn and turn about, you know. fathead, ft, fade away, fit, fit out, fade, Fet, fifth, fiat, fitted out, foetid, fetid, footed, feed, fatheaded, fuddy-duddy, foot, fda, feud, FTO, fete day, Fatah, fat, feat, fadeout, fahd, food, fatwah, fado, fed, fade out, fatty, fad diet, fated, FPD, fad, fatuity, Fatihah, Fatiha, faded, fatwa, fifty, foodie, fate, fete, fifty-two, faddy, fiftieth. hindooism, zoroastrianism, cult, shintoism, Asian Shamanism, brahmanism, christianity, ecclesiasticism, Manichaeanism, revealed religion, Hsuan Chiao, shamanism, buddhism, theism, taoism, hinduism, shinto, analogy, brahminism, paganism, mithraicism, unitarianism, sikhism, religious cult, nature worship, doctrine of analogy, cataphatism, Christian Religion, Cultus, mazdaism, Manichaeism, WICCA, pagan religion, Bahaism, mithraism, mysticism, heathenism, apophatism, religious mysticism, jainism. belief, supernatural virtue, theological virtue.